For years, Guy Gorney, 64, of Manhattan, Illinois got away with the perfect crime. It was premeditated, plotted down to the very minute and, with the help of another man, he walked up to his prey, aimed and pulled the trigger. His victim stood little chance, he was unaware he was even being stalked. In fact, he was sleeping when the first bullet entered his body, jolting him awake with burning pain. Seconds later he was dead after Guy shot him twice more. But now that video evidence has come to light and made its way to the internet, everyone knows exactly what Guy did, and what type of person he is — a coward and a killer. Guy's victim was an African lion, laying down, basking under the African sun when he and his guide took aim and murdered the feline. In the clip, Guy's guide whispers instructions on how best to kill the sleeping beast and then the two celebrate as the lion — that was alive just minutes before — slowly extinguishes. The video has now gone viral and people all over the world are shocked at what this "hunter" did. But Guy couldn't care at all. In an interview, he showed no remorse. He bragged about having killed at least 70 other big game animals including elephant, lion, leopard, rhino, and buffalo. One might ask how many of those poor creatures were also sleeping. There really is nothing more pathetic than a tiny man with a big gun who bases his manhood on his ability to shoot animals. Is this the type of "hunting" Zimbabwe allows in their country? Where wealthy men pay large sums of money to kill defenseless animals? Is this considered "sportsmanship" and good for conservation? People who behave in such despicable ways, don't deserve to own guns, and they definitely shouldn't be allowed to travel and kill animals willy nilly just to stroke their ego. 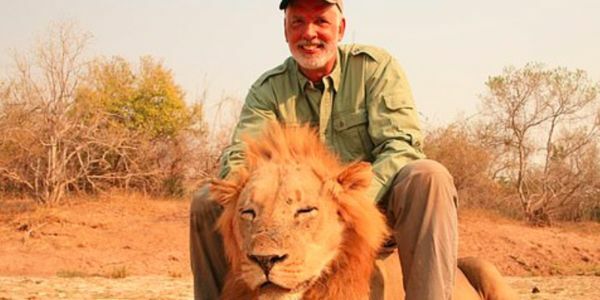 Zimbabwe should make an example of Gorney's deplorable behavior and permanently ban him from hunting within their country. Sign the petition if you agree.